The largest gay ski event in the southern half of the world sees hundreds of people flock to Queenstown, NZ during the last part of August and early September, every year, for a full week of skiing, drinking, dancing and adventure. The next official DNA Gay Ski Week will happen August 27 to September 3, 2016. Start making your plans now. Here’s a report by ManAboutWorld correspondent Michael Siebert who is pictured here (on the left in the photo above) with his handsome friend, Joao. 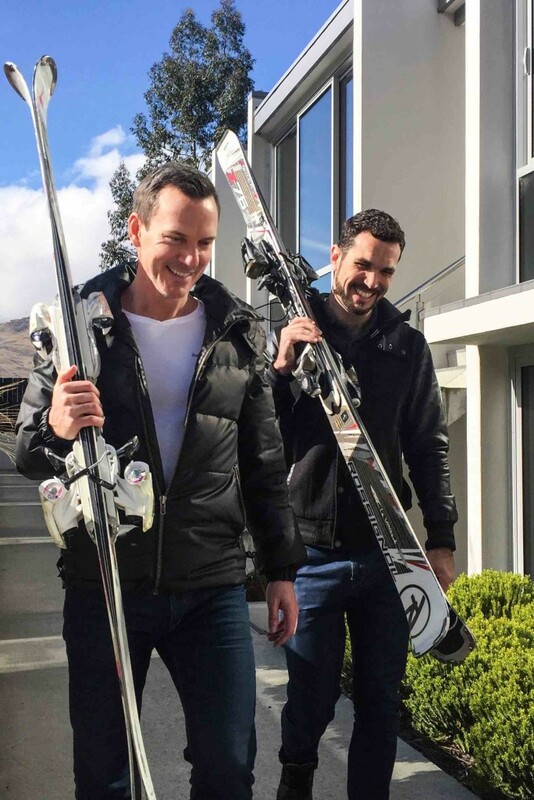 They enjoyed Gay Ski Week with hundreds of gay ski and boarding aficionados but also spent a little time exploring Queenstown and surroundings. Queenstown is an adventure town. Consider skydiving and all the other options available to a fun-seeker. Days trips to Milford Sound or Doubtful Sound are available; however, I would consider an overnight boat tour so that you are able to see the sound at sunset and sunrise. Exploring the lake area is a lovely option as well. Another option: One could rent a car in Christchuch and drive through the lake regions for some spectacular views, but the drive is approximately 6-7 hours from Christchurch to Queenstown. Ski season in Queenstown is from mid-June to early-October. 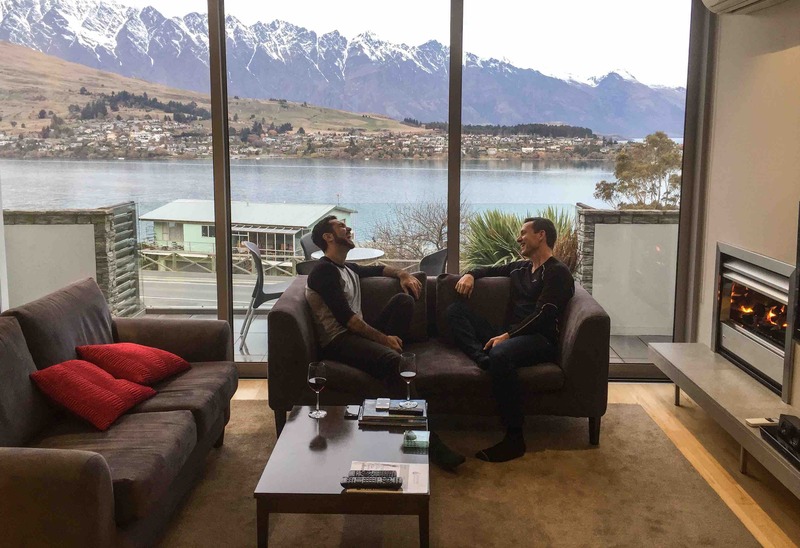 If you plan for early October you just must might have the slopes to yourself and it is a perfect time to stay at Pounamu since it is just outside their busy season. This year, our gracious host, Pounamu Apartments was a an excellent place to call home for a week of skiing and relaxation. The views and comfort, along with the excellent hospitality, you will feel like a local in no time. Pounamu is short 10-minute walk to the city center; however, you will have the comfort of your own kitchen, fireplace, fantastic views, service and the staff are available to help customize your trip to your liking. If walking is not your thing, rent a car for your trips to the mountain and surrounding areas; however, walk to the center of town, the traffic will drive you mad and parking can be difficult. Pounamu offers covered car parking and free WiFi. You can also relax in the outside spa after a day on the mountains. Skiing in Queenstown does require a short bus ride (if you do not have your own car) to any mountain (three to choose from) and the bus stop is just outside the front steps of Pounamu. Can’t wait till next August? ManAboutWorld will cover gay ski events in the Northern Hemisphere in our next issue. Stay tuned. DOWNLOAD MANABOUTWORLD: Discover the world’s best gay travel content in our unique digital magazine for savvy gay travelers by downloading the ManAboutWorldApp on the iTunes App Store or Google Play. We support iPads, iPhones and Android devices. There are a few FREE publications in all of the apps, and you can click here to register for a FREE three-month subscription. Go on, what are you waiting for!